PYUTHAN, Nov 28: Only a handful of students used to go to school in the district some time ago. They hardly stayed at school after their lunch break. Most of the students used to rush back home once they heard the lunch break bell, and they would not return for classes. This was the problem in almost all the schools. The situation, however, has changed since the schools started providing mid-day meal to students. These days, students no longer have to return home early due to hunger. They have started attending classes now. Government-run schools have started mid-day meal programs targeting the poor families in the remote areas. This has not just improved the attendance of students but has also increased the enrollment rate. The students of Dipendra Primary School (DPS) in Jhimruk Rural Municipality-4, Wangemarot have been regular in their classes since the school started providing free mid-day meal for them. Most of the students here belong to the Dalit community. Jagat Thapa, principal of DPS, expressed his happiness regarding the improved attendance of students since mid-day meal was arranged. "Most of the students are Dalits. Earlier, they used to spend their time at home by playing but now they have started coming to school as they can have lunch here," said Principal Thapa. According to him, even the parents have understood the importance of sending students to school. Chani BK, one of the parents, said, "There was a time when our children used to go to school only once or twice a week. But now, they don't miss their classes." In the past, not even 90 students were enrolled in DPS but now there are more than 120 students. 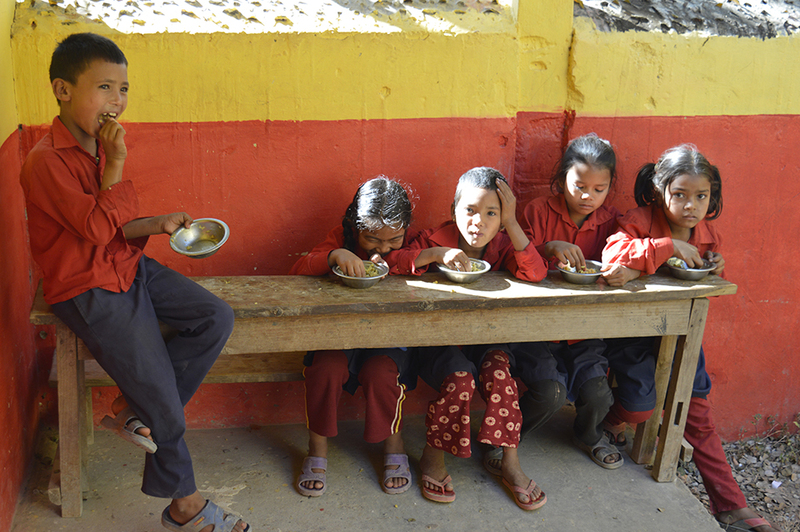 Mid-day meal has proved to be an effective means to improve attendance and enrollment of students in Sallghari Primary School (SPS) of Pyuthan-1 as well. It has been more than a year since SPS started providing free lunch to the students.